YES! 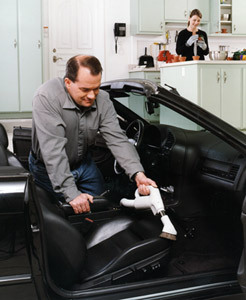 99% of central vacuums, no matter the brand, are “plug-and-play” with any of the kits below. If you have any questions at all, please give us a call at Vacuum House of Marshfield. The Stealth Kit is at the top of its class for durability, control, and power. For consumers wanting the industry’s best, the Stealth is the right choice for all of your cleaning needs. The TurboCat is the industry’s best air-turbine cleaning head. It has the cleaning power of rotating bristles without the inconvenience or cost of an electrical cord. The light-weight hose employs an on/off switch on the handle. Modern Day central vacuum units exude timeless quality with technical performance. Easily meet the unique cleaning needs of your home while receiving all the benefits of using a central vacuum system. ModernDay is designed for value, being built specifically for small to medium-sized homes.